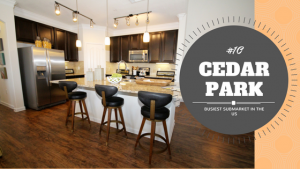 Cedar Park is the 10th busiest apartment submarket in the United States, according to an article by Property Management Insider. The submarket, located in Williamson County, includes Cedar Park, Leander and Liberty Hill, added 2,947 units since 2012. That’s a 63.6% growth in the number of apartments. 1,672 more units are projected to be ready by January 2018. Most new apartments are being added in the southern portion of the area, near Highway 45 and Highway 183. The apartment occupancy rate is 96% and the average monthly rent is $1,122. RealPage.com reports that Cedar Park’s median family income is $82,375, which is 28% higher than Austin’s and 54% higher than the median family income in the nation. The median age is 34.6, there are .58 employees per household, the population is 157,305 and 94.3% of the adult population are high school graduates, 43.2% have a bachelor’s degree or higher. The area has also seen a lot of growth in the retail sector and is close to Lake Travis, the Hill Country, and other affluent suburbs of Austin. It’s conveniently located 17 miles northwest of Austin, and commuters can use 183 rather than I-35. The Cedar Park submarket has a lot of parks and highly ranked public schools, all at a lower price than surrounding areas. As a bonus, commuters who prefer not to drive can use the MetroRail, which has two stops nearby: Lakeline and Leander. Lots of high tech, medical, and other employers are nearby both along 183 and in adjacent Round Rock. Some of the biggest employers in the area include: Cedar Park Regional Medical Center, a hospital that employs 600 people; National Oilwell Varco, an oilfield services provider employing 429 people; ETS-Lindgren, a systems manufacturer, which has 270 employees, BMC Select, Inc., whose building manufacturing and distribution center employs 250 people; Coreslab Structures, which creates concrete products at their 250 employee manufacturing facility; and finally Meridell Achievement Center, a psychiatric care facility with 200 employees. What is there to do in Cedar Park? Shop at 1890 Ranch and Lakeline Mall, golf at Twin Creeks Country Club, Crystal Falls Golf Club, and Avery Ranch Golf Club, or take a ride on the Austin Steam Train. There’s also more than 1,000 acres of park space in the area! So what can you expect in an apartment in the Cedar Park submarket? In Cedar Park, you can get a one bedroom, one bathroom, 827 square foot apartment for $889 or a three bedroom, two bathroom with a loft with 1,360 square feet for $1,429. This pet friendly community is close to 183 and public transportation, including the Metro Rail station, and has a basketball court and covered parking available. Apartments have vaulted ceilings, balconies, fireplaces and hardwood flooring. Another option with a Cedar Park address is a community that is close to Parmer and 1431 and shopping. Apartments range from a one bedroom, one bathroom with 695 square feet for $900 to a three bedroom, two bathroom with 1,332 square feet for $1575. Apartments have stainless steel appliances, alarm systems, private balconies or patios and include washer and dryers. The community is gated and has a pet park, Starbucks Coffee Bar, Gift Wrapping Station, Resident Gaming room and even an on-site Car Wash! Looking to get away from it all? In a serene hilltop setting, you can get a one bedroom, one bathroom with 590 square feet for $1,090 or a three bedroom two bathroom with 1,415 square feet for $1780 in Cedar Park. Amenities include a fenced dog park, a 5,300 square foot residents club with a pool table, fireplace, tvs, and a kitchen. Apartments security systems, nine-foot ceilings, available separate tubs and showers, and more. If you’d prefer a Leander address, you can get apartments ranging from a 576 square foot one bedroom, one bathroom for $905 to a 1,446 square foot three bedroom, two bathroom for $1800. There are apartments with fenced yards available, all units include a washer and dryer, and kitchens have granite counters and chef-inspired kitchen islands. The community is close to 183A, Metro Rail, and the Crystal Falls Golf Course, plus there are nearby parks, shopping, and restaurants. Another fantastic Leander community has units ranging from one bedrooms with 673 square feet for $985 to two bedroom, two bathrooms with 1,209 square feet for $1465. Apartments have undermount sinks with goose-neck faucets, glass tile backsplashes, 2 inch faux wood blinds, and outdoor spaces. The community features a fitness center with on-demand spin studio, paved hike and bike trail access to the MetroRail and future Austin Community College Campus and covered parking and private garages available. Looking for your next apartment in Cedar Park, Leander or nearby? Give Austin Apartments Now a call today at 512-258-8224 and have an experienced apartment locator on your side with knowledge of the latest vacancies and move-in specials at all the best addresses in Austin and beyond!